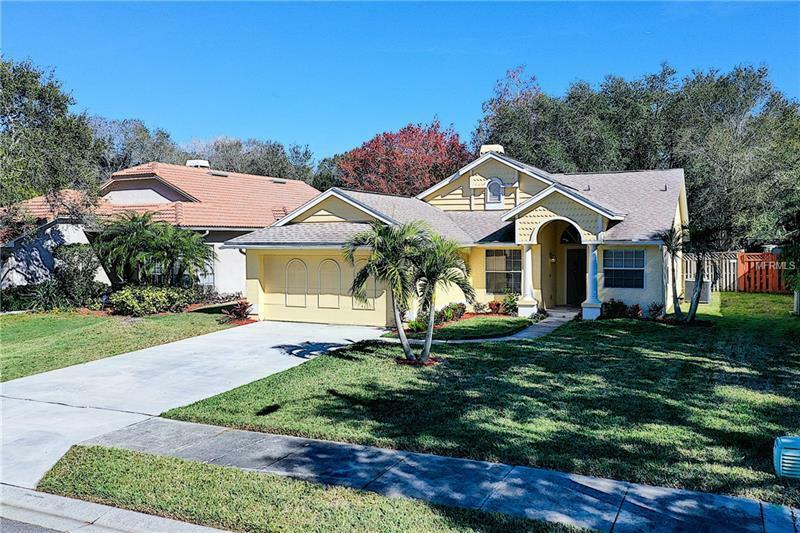 Welcome home to the sought-after Green Springs neighborhood in vibrant Safety Harbor! Beautifully updated throughout, the kitchen boasts custom wood cabinets and granite counters, stainless steel appliances with a breakfast nook. Entertain family and friends for holiday dinners in the separate dining room. The living room has vaulted ceilings with a wood-burning fireplace and sliding glass doors overlooking the tranquil outdoor screened pool. The spacious master suite also has vaulted ceilings with a door to the pool area and adjoins the master bath with a walk-in shower with stone tile, a luxurious jacuzzi tub and a beautiful custom-made vanity with dual vessel sinks. The flooring throughout is upgraded wood grain porcelain tile. There are two additional sizeable bedrooms, one with a walk-in closet and sliding doors opening to the pool area. Relax in the solar-heated pool which has been newly resurfaced or let the dogs play in the fenced in backyard while you swing gently in your hammock! This property is ideally located to enjoy the shops, restaurants, fantastic community events and activities in downtown Safety Harbor. Easy access to interstates and Tampa International Airport.